Pupils from Gypsy, Roma and Traveller backgrounds estimated ten times less likely to go to university compared to peers. New research by LKMco, in partnership with Kings College London’s Widening Participation department reveals barriers ‘at every level’ that combine to make Gypsy, Roma and Traveller pupils one of the most under-represented groups in UK universities. The new report shows that ongoing prejudice combines with poor school outcomes to make progression to university a struggle for many pupils. Yet new research suggests that better information, and reassurance that racism will not be tolerated could awaken interest that lies just beneath the surface. Back in 2004 Sir Trevor Phillips described prejudice and discrimination directed at GRT groups as “the last respectable form of racism”. This new research shows this continues to be the case with members of the Gypsy, Roma and Traveller communities telling researchers that ‘remorseless bullying’ has led many pupils to hide their identity and to feel that they were not welcome in education. Prejudice combines with a lack of knowledge of university, cultural norms and low academic attainment to make application and acceptance to university a rarity, the report says. 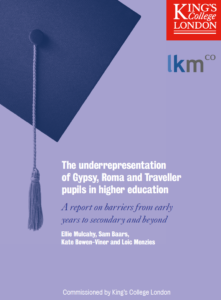 The new report by education think-tank LKMco, entitled ‘The underrepresentation of Gypsy, Roma and Traveller pupils in higher education: A report on barriers from early years to secondary and beyond” is published today by Kings’ College London’s Widening Participation Department. Researchers spoke to pupils, parents and experts and analysed data on outcomes from the early years through to A-Level. Gypsy, Roma and Traveller (GRT) pupils are ten times less likely to go to university: 3-4% of Gypsies, Roma and Travellers aged 18-30 accessed Higher Education in 2014, compared to 43% of 18-30 year olds in the national population. 9 out of 10 GRT pupils leave school without five good GCSEs: Fewer than 10% of Gypsy/Roma pupils and fewer than 20% of Irish Traveller pupils achieve 5 GCSEs graded A*- C, compared to approximately 60% of all pupils nationally. Even at the end of reception year, only a quarter of Gypsy and Roma pupils achieve “a good level of development” compared to more than two-thirds of pupils overall. Rumours of student ‘pikey parties’ and prejudicial language used by university staff put some potential students off. Half of British peopleadmitted having an ‘unfavourable view’ of Roma people in a 2014 survey. Some young people hesitate to apply to university because of fear of debt and perceived incompatibility with a traditional way of life. However, a changing economy and better information could start to boost participation rates. Schools and universities should publicly state that prejudiced and derogatory language is unacceptable. Targeted awareness raising about university should begin at primary level. Where pupils are educated at home, support should be put in place that ensures that provision is high quality. Universities should ensure that their widening participation teams target home-educated pupils. Parents and pupils should be encouraged to ‘ascribe’ (identify their GRT status) through use of appropriate categories and reassurance that this will not result in discrimination. A formal launch for the report, will take place at the Brilliant Club Annual Conference on Saturday the 8th of July. Follow the conversation using the hashtag #TBCxKCL16. This is the second joint report published by Kings College London Widening Participation department and LKMco. The previous report published in 2016 explored the underrepresentation of white working class boys. King’s College London is committed to finding the brightest minds regardless of their background and supporting them in accessing higher education. We believe our diverse student body enriches the education that we offer. Our website details the programmes and activities the Widening Participation Department provide for prospective students, teachers, parents and carers. kcl.ac.uk/wp@kclwp [email protected] 0207 848 4132. 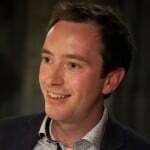 The Brilliant Club was set up in 2011 to widen access to highly-selective universities for under-represented groups by mobilising researchers to bring academic expertise into state schools. Through their Scholars Programme, the organisation trains PhD and post-doctoral researchers to deliver university-style tutorials to small groups of pupils, often based on their research. The pupils also visit highly-selective universities to gain information, advice and guidance and to see for themselves what university life is like. Their second programme, Researchers in Schools, is a teacher training and professional development programme exclusive to researchers who have completed a doctorate. It exists to increase and disseminate subject expertise, promote research and champion university access within schools by training researchers to become highly-effective classroom teachers and future subject leaders in the education sector. The Brilliant Club currently works with over 6,500 pupils per year nationwide. For more information visit www.thebrilliantclub.org.